Furano is the most famous of all the ski resorts in Japan; however, it is still relatively undiscovered by foreign tourists. Furano is known for its light, powdery snow, of which up to 29 feet (9m) falls each year, and equally for its amazing weather, with more sunny days than any other resort on Hokkaido. 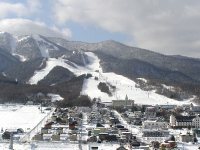 The Furano Ski Area is divided into two areas: the Kitanomine zone, open from mid-December to late March; and the Furano zone open from late November to early May. Both areas have a range of accommodation, restaurants, and après ski options, all just minutes away from the town of Furano by shuttle. The town of Furano offers many cultural attractions, including ancient shrines and temples along with theatres, spas, shopping markets and locally-produced cheese, wine, and ice milk. Visitors should be sure to visit the town's many museums, cafes, and galleries. The slopes in the Furano Ski Area offer good skiing opportunities for all levels. The slopes are divided in to two zones: The Furano zone and the Kitanomine zone. There is a family ski area at the base of the Furano zone, and first timers are warned that there are no beginner courses from the top of the Kitanomine Gondola. The Furano Ski School is located at the base of the Kitanomine zone. Furano is comprised of several small farming towns around a municipal centre. The region is known for its picturesque lavender fields and vineyards as well as for its powdery snow, and visitors can enjoy an array of locally-produced goods like wine, carrot juice, and cheese. There are a number of hotel shops and grocery stores selling this produce but the best place to go shopping for souvenirs in Furano is Ningle Terrace where you can find a charming collection of craft shops in small log huts. Here you will find local artists, glass makers, and jewellery crafters. There is a wide variety of eating out options in Furano, with a few restaurants a short stumble from the slopes and many different restaurants in town. There are plenty of great sushi restaurants, many eateries selling simple international staples, French, Italian, and Chinese restaurants, and a number of pubs and karaoke bars to keep holidaymakers entertained. Although there is not much of a clubbing scene, Furano has plenty of bars, pubs, and restaurants which promise visitors a spot of night-time revelry. The Furano Tourism Association is very proactive and often organise a number of interesting cultural events, such as traditional Japanese music performances, which are usually free of charge and allow tourists to interact with locals and enjoy Japanese culture. There are also theatres and art galleries to be investigated. Visitors can enjoy a number of fun outdoor activities at Furano, including snowmobiling, snow rafting, hot-air balloon rides, cross country skiing, and sledding. There are also many tourist attractions in the city; a popular rainy day activity is a tour of the local cheese and wine factory where you can help make and sample cheese, ice-cream, and butter. The resort is also bordered by Hokkaido's incredible Daisetsu-zan National Park, a wonderfully scenic area for tourists to explore. There have been some complaints about groups of foreigners becoming too rowdy on the slopes.